'Your life...In 300 words or less'. Even the most seasoned professionals find business school application essays to be among the hardest pieces they ever write. With applicants coming to the nation's top schools from the most successful companies and undergraduate programs in the world, a simple biography detailing accomplishments and goals isn't enough. They need arguments that grab admissions officers and don't let go. To help them write the essays that get them accepted to Harvard or any of the country's top programs, the staff of "The Harbus" - HBS' student newspaper - have updated and revised their collection of 65 actual application essays and their detailed analysis of them so that applicants will be able to: avoid common pitfalls; play to their strengths; and, get their message across. 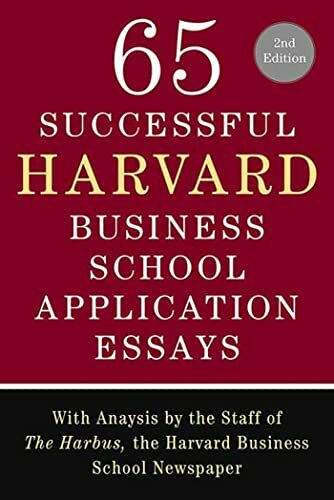 Wherever they are applying, the advice and tested strategies in "65 Successful Harvard Business School Application Essays" give business professional and undergraduates the insider's knowledge to market themselves most effectively and truly own the process. The Harbus is the official student newspaper of the Harvard Business School, the number-one business school in the country. This weekly has been providing the news to students, faculty, and alumni since 1937.